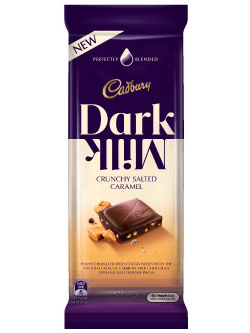 Perfect blend of rich cocoa notes with the smooth taste of Cadbury Milk Chocolate with Salted Caramel Pieces. Sugar, Cocoa Mass, Cocoa Butter, Milk Solids, Salted Caramel (Sugar, Invert Sugar, Milk Solids, Wheat Glucose Syrup, Salt, Raising Agent (E500), Emulsifier (E322)), Emulsifier (Soy Lecithin), Natural Flavour. Contains Chocolate (90%), Salted Caramel Pieces (10%). Chocolate contains cocoa solids 40%, Milk solids 14%. Silky, creamy with the crunch.